Can I Do Weights Two Days in a Row? There are two schools of though regarding frequency when it comes to weight training. Some people believe that you should train frequently, often two or more days in a row, to make the best gains, while others prefer a more conservative approach, resting for at least a day between sessions. Whether you can efficiently train with weights two days in a row depends on many factors, including what type of training you're doing, your goals and how fatigued you are. 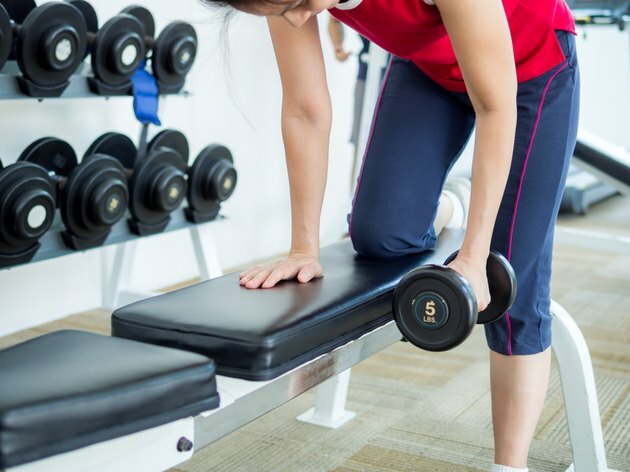 After an intense training session, you will often experience delayed onset muscle soreness, which can cause your muscles to feel tight and painful. This soreness is caused by the breakdown of muscle fibers during the lowering, or eccentric, phase of an exercise. If you experience particularly bad DOMS after a training session, you may wish to take a day's rest, because training for a second consecutive day may make you weaker and more susceptible to injuries. However, to avoid excessive DOMS, you could experiment with eccentric-less training. Strength coach Christian Thibaudeau advises doing eccentric-less exercises with a prowler, or set of blast straps, to reduce muscle soreness, which may enable you to train two days in a row. Overtraining syndrome can occur when you place your body under too much stress as a result of exercise, and do not provide it with adequate rest or nutrition. Overtraining can make you feel fatigued and unwell, and can drastically reduce your performance levels. If you have had a particularly demanding training session, especially one in which you have performed a number of sets to failure, or have been working at a high percentage of your one repetition maximum, you would be wise to rest for at least a day before training again, because too much cumulative stress can lead to overtraining. Strength coach Dan John advises in his article "The Gable Method" that if something's important, you should do it every day, and kettlebell trainer Pavel Tsatsouline bases his "Grease the Groove" training method around the idea that "Specificity plus frequent practice equals success." Both of these philosophies support the idea of performing certain exercises daily. If you have an exercise that you struggle with, you should aim to do it every day. Use light weights and focus on using perfect technique, only taking a rest day when you have to. The key here is that daily practice is needed if you wish to improve. Whether you train two days in a row or not also depends on the routine you are doing. If you are following a full body program, or doing high intensity training, you will need to leave at least a day's rest between sessions. If however you are following a four way body part split, or an Olympic lifting program, then there will be times when you have to train two or more days in a row to meet the requirements of the routine. How Many Times a Week Should You Work Out a Body Part? Do Athletes Train Using an Upper Lower Split or Full Body Workout? Can I Work My Core Every Day?